Consisting of 130,000-plus internist members, The American College of Physicians (ACP) is the largest medical-specialty organization in the United States. When ACP wanted to improve the organization's member recruitment and retention rates, particularly among young internists, ACP turned to DDA Medical. 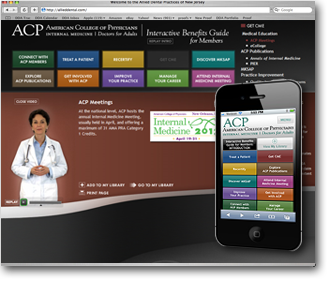 To promote ACP's membership benefits, DDA Medical suggested a proprietary SmartSiteT in which all main sections include synched video, text, pictures/graphics, and related links to ACP's main website where users can learn more about any given topic. The SmartSiteT DDA Medical designed and developed for ACP allows users to close and reopen the video, print pages, add items of interest to a personal library area for easy reference at a later date or to email to a friend or colleague. DDA Medical took ACP's promotion to young internists a step further by designing and developing a Smartphone version of the website that provides for easy navigation on smaller, mobile touch screens. In addition, DDA Medical built in tracking mechanisms for the Interactive Benefits Guide that allows ACP to monitor the number of visits and navigation of new and existing member users.